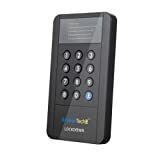 3.5" Hard Drive USB Enclosure with Hardware Encryption Keypad? I've noticed that you can get a USB hard drive enclosure with hardware encryption fairly inexpensively on Amazon. For example, the first item that pops up when you search for "usb enclosure with hardware encryption" is the FahanTech Encrypted Hard Drive Enlcosure 2.5-Inch SATA to USB 3.0 External Hard Drive Enclosure with 256bit Hardware Encryption Keypad. Supports 9.5mm 2.5inch SATA HDD/SSD for $36.99 with free Super Saver shipping. That's excellent price for a case with hardware encryption and an external password pad. But so far, I have not been able to find a 3.5" hard drive version. It seems that everyone is selling the 2.5" version, because most people use it for mobility. But I'm trying to protect precious family data from home burglary and we are already bumping up against the largest drive in the 3.5" form-factor. We really can't downgrade to 2.5" drives. Anyone know where I can find 3.5" USB enclosures with hardware encryption?